Nestling at the head of a little valley to the south of Honiton in East Devon in an area designated for its outstanding natural beauty is Boycombe. This Grade II* listed manor house, probably built in the reign of Henry VII, is set in its own estate of a couple of cottages, farm outbuildings and 40 glorious acres of countryside. A new web design and development built on the Drupal CMS* Platform. 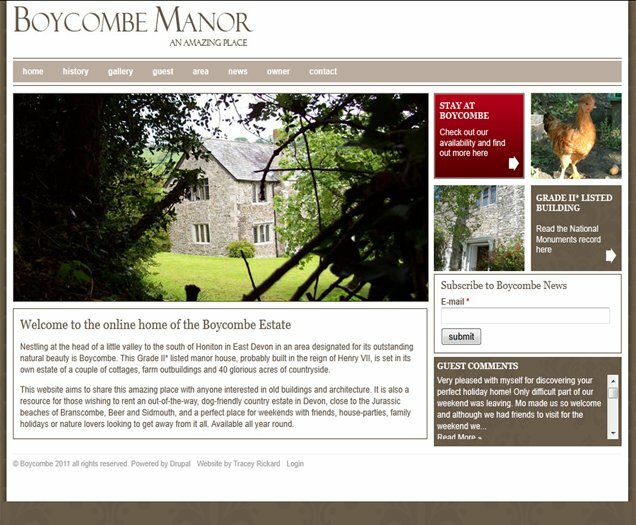 The client wanted a site to show off the manor with plenty of opportunity to upload new images and edit content. The site was built on the CMS platform, which resizes images to fit upon upload. An image gallery on the home page allows the client to show off lots of images in a restricted space. There were some really beatiful images to use throughout the website and so I took full advantage of using them with blocks of colour to bring it all together. The guest comments only has a restricted area to be displayed so it scrolls within the frame on the right hand side of the home page. I created the logo with a font called Felix Titling, which seemed stately enough to fit this wonderful property. I used Georgia serif font for the main headings and the main body font is Verdana. 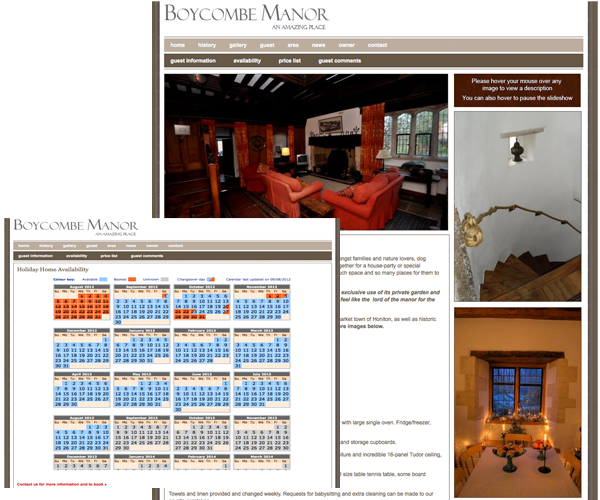 Visitors are able to check availability, download information, submit their booking online and give feedback online. They are also able to sign up to a newsletter that automatically sends out a notification when news items are added. This was only one of two websites that I built with Drupal, I quickly moved onto WordPress when I realised that something more user friendly was required for my clients.